Lesta Frank and I had been wanting to repeat this popular Whiter Shades of Pale workshop collaboration, and yesterday we got to! Yay! 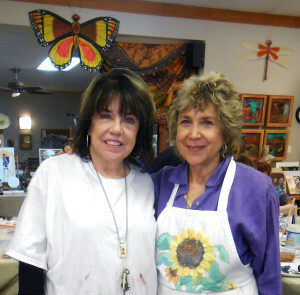 Plus we got to teach it at Lesta’s cozy studio – what a treat. We added a few more things to the mix this time, including beeswax and gold book foil. 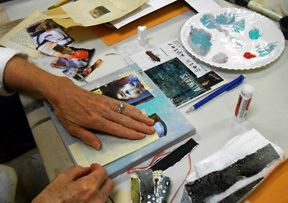 Some of the participants had not worked with encaustic techniques before and they loved it. As usual, the results from this workshop were fantastic. We had a full day to work on this project, including a lunch break in Lesta’s sunny back yard. Take a look at the video, and then, at the end of the post, I’ll share some of the things we did in the workshop. There really are no rules, just guidelines and suggestions. Discovery comes through experimental play. You can see the steps in progress on the video – these steps, combined with everyone’s individual ideas, led to stunning (and pale) results! Art unites. 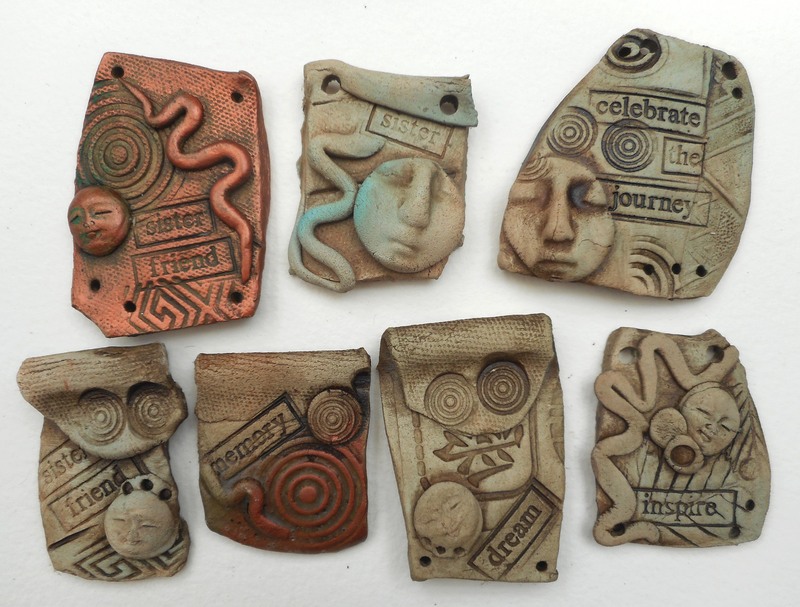 Keep up the good work with your creative life – onward through the fog, one step at a time! 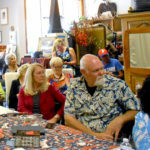 Lesta and I had such a great time teaching this workshop last September. We’ve decided to repeat it, this time at Lesta’s studio. 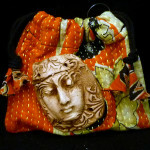 The date is Saturday, January 21st and it’s an all-day workshop from 10-4. Click this registration link for more information. If you’d like to take a look at the last Whiter Shades workshop at my old studio, here’s the video. Notice how mellowed out Mary Beth is – this workshop will totally calm you! Remember that the best way to know when a new workshop is announced is right here on my SHARDS blog. Thanks for reading – and happy new year! Lesta Frank has a ray gun – she brought it to our all-day Whiter Shades of Pale workshop yesterday, and when anyone “called color” on another person (like, they were reaching for some red paint), they got blasted with flashing lights and wild beeps. It was pretty funny! The whole day was a delight, as a matter of fact. 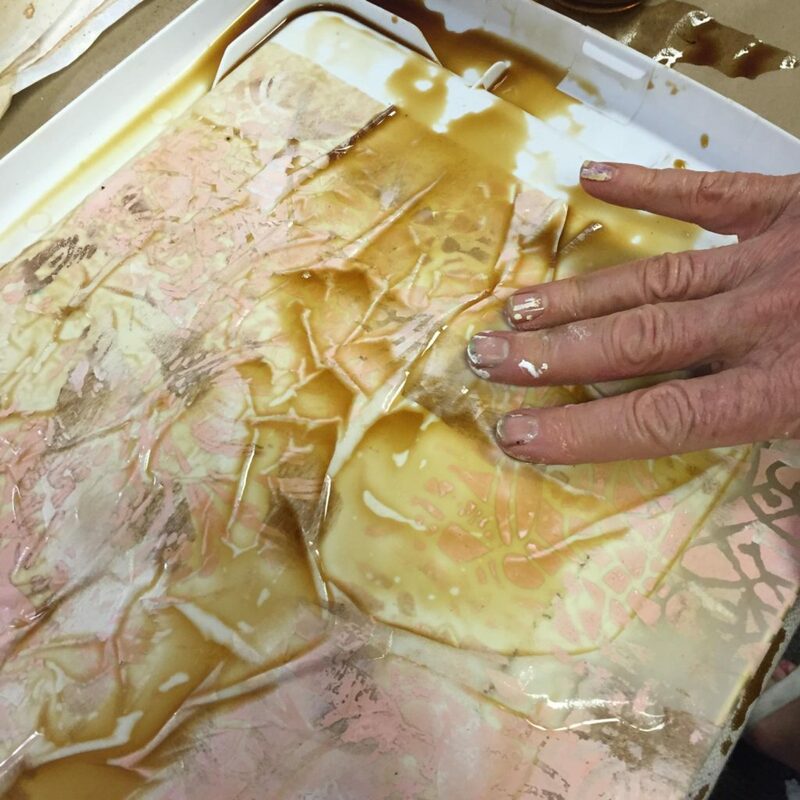 In the morning, we made beautiful pale papers under Lesta’s expert tutelage – ecru, ivory, palest gold and silver – all breathtaking. 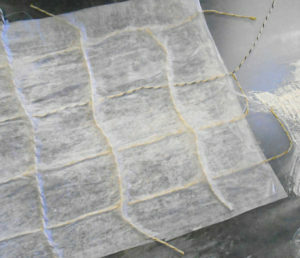 A favorite was the string-embedded paper. 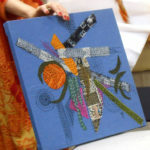 In the afternoon, we used those papers to create stunning assemblage/collages with the hand-embellished paper and found objects tied into our canvases. The video from the workshop is just pure eye-candy. It’s astonishing how much richness and variety can come from such a a limited color palette. 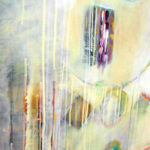 Limiting the color choices allows you to concentrate on texture and composition. 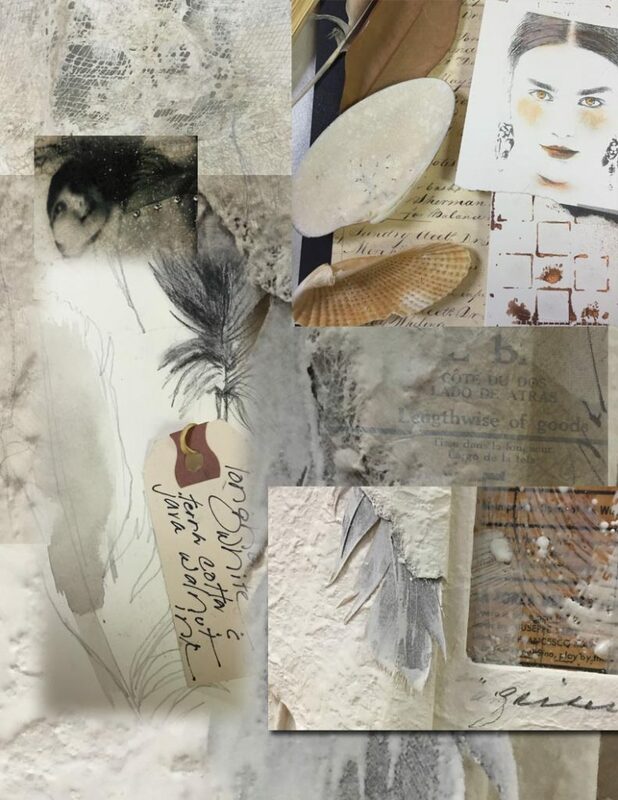 Pale colors and textures are so wonderfully nostalgic that I thought I’d treat you to the original inspiration, the song called “A Whiter Shade of Pale” which won a Grammy for Procol Harum in (gulp) 1967. The video looks so sweet and goofy – very non-MTV. But boy, does it bring back memories! 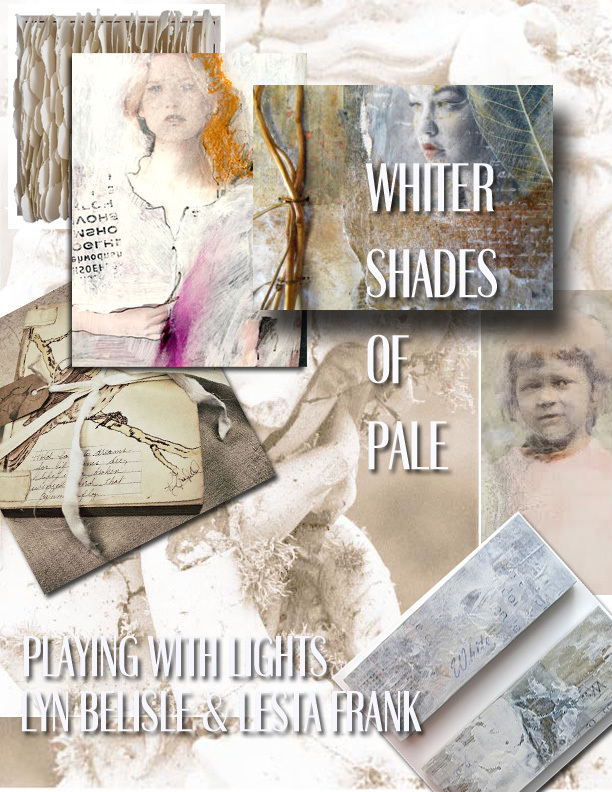 Lesta Frank and I are teaching a workshop this month called Whiter Shades of Pale. 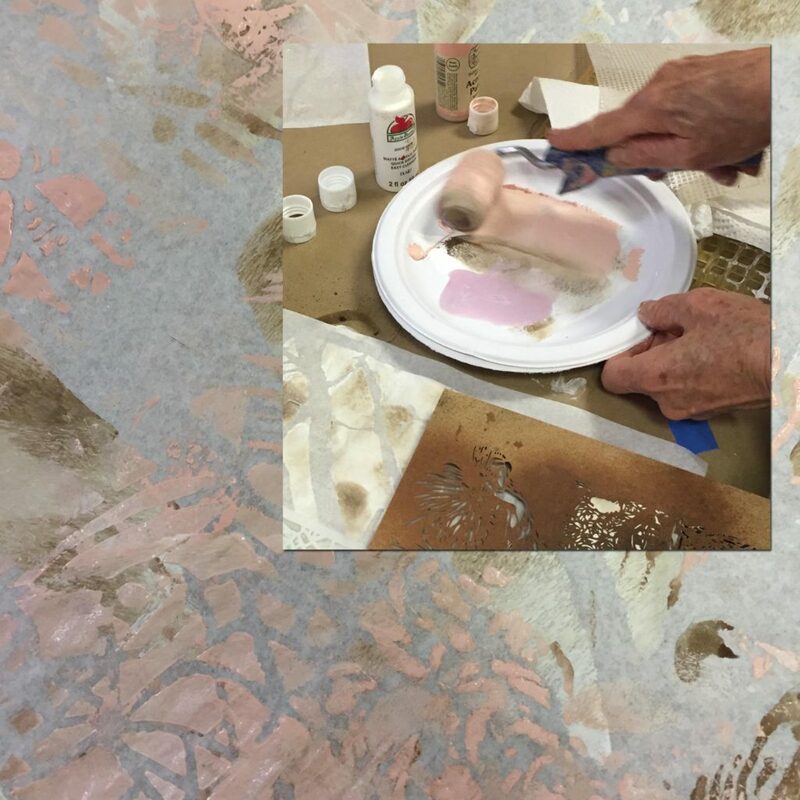 Recently we got together at my studio to play with surface design of all kinds and create papers that have subtle painterly textures and intriguing variations of the palest tints. 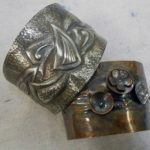 The workshop has been sold out for a while, but I thought you might like to see some of the results from our pre-workshop experiments. 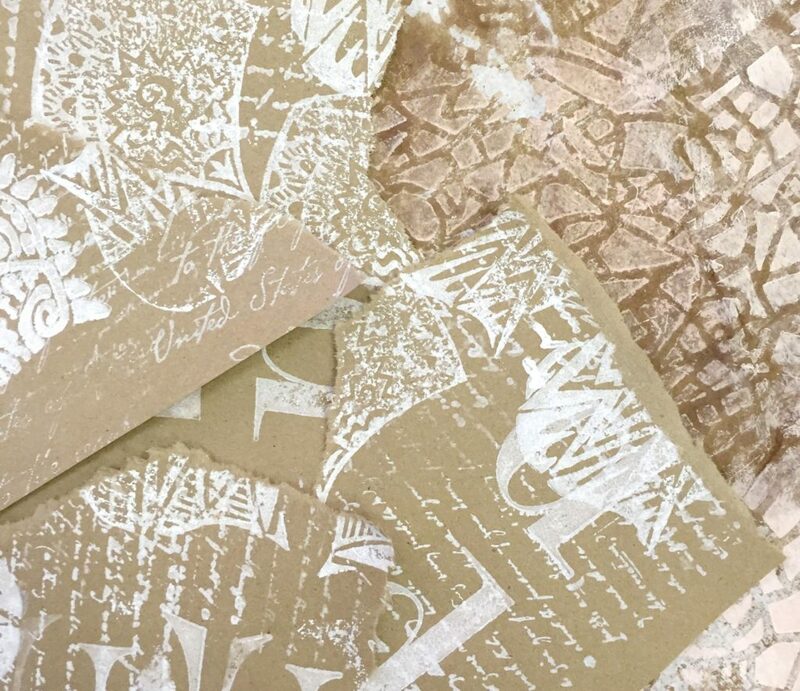 The first idea, below, is so simple – you just do a reverse stamp onto tan kraft paper (like a shopping bag) using a white stamp pad or white acrylic paint soaked into a damp piece of felt. Another variation we did was to roll white acrylic paint onto a textured placemat and print the design onto the tan paper. 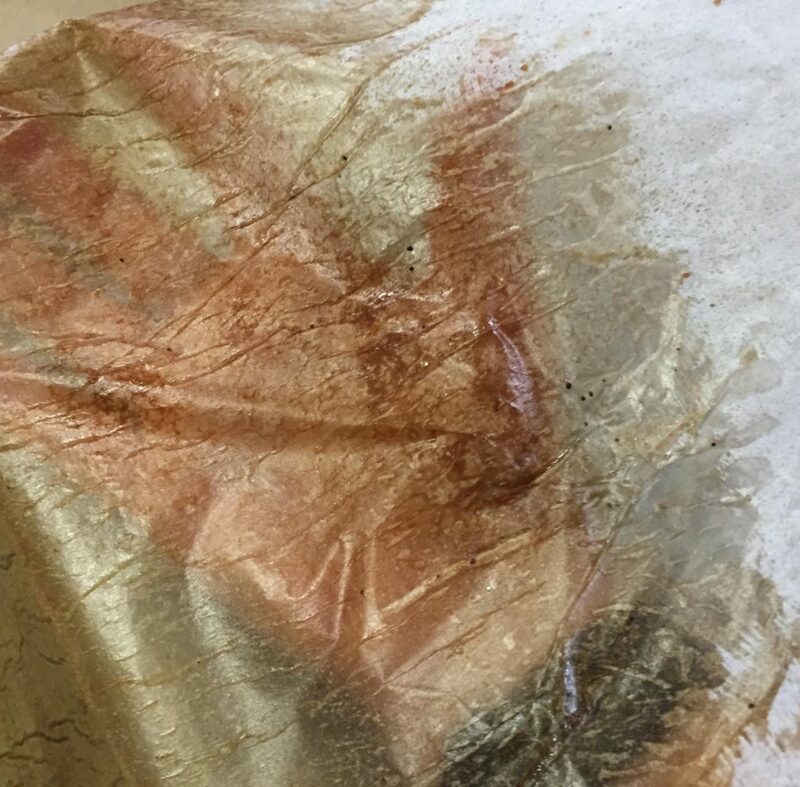 Below, tissue paper has been painted with clear acrylic matte medium, which causes the paper to wrinkle a bit, and then it was sprayed with walnut ink. It’s almost like tinted glass! This is one of my favorites. Lesta stenciled white acrylic paint onto deli paper using a small paint roller, and after it was dry, soaked it briefly in strong coffee to “age” it. 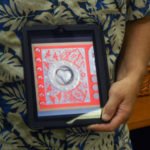 This is an easy “cheater-ly” way (below) to make multiples of subtle designs for ready-made custom collage paper. We just lay various pale papers on a scanner, scanned them in to the computer, and then printed out 8.5″x11″ composite-designed papers. Lesta tinted the face on the example below with Portfolio oil pastels. 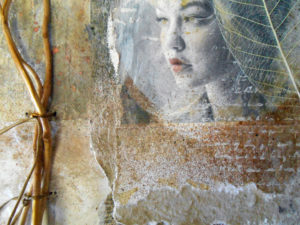 Cheesecloth can be used in so many ways to add interest to collages with pale papers. You can Gesso it and let is dry, then cut it into fragments. 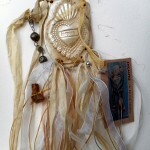 You can use Gold Gesso as well. 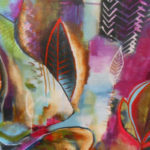 You can also add it as a layer over textures, then paint over it with light tints of acrylic paint. 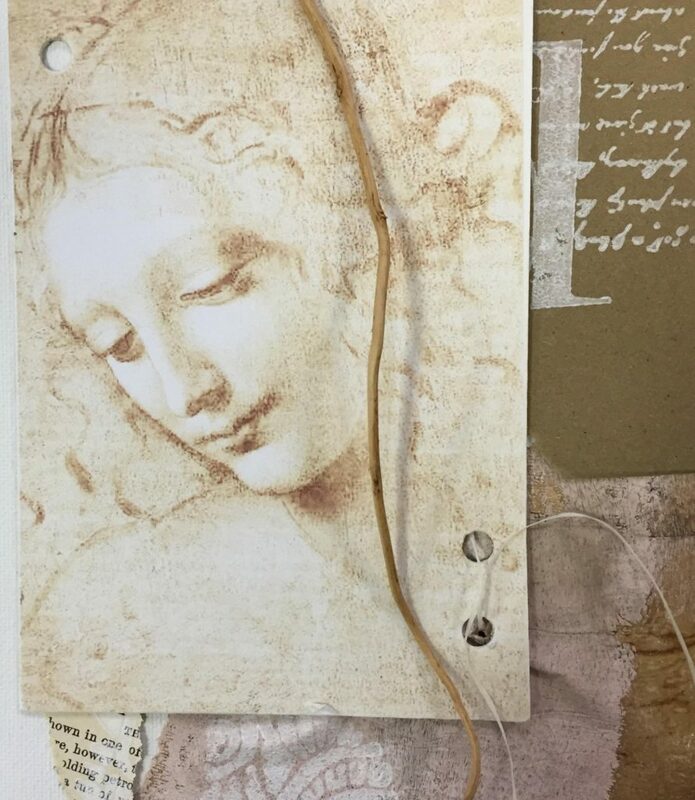 Finally, don’t forget that you can lighten images with your printer using MS Word – here’s a Renaissance face with its contrast decreased, printed on a plain piece of inkjet paper and mounted to matboard. 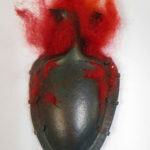 I punched holes and will attach this to a collage as one of the final layers – hmm, and maybe cover it partially with tissue? If you want to play around with pale papers, here are some materials you might want to try. I hope you have a chance to use some of these ideas – you can make just a few pale papers and collage little 3×5″ creations for cards. Or whatever – pale is pretty! 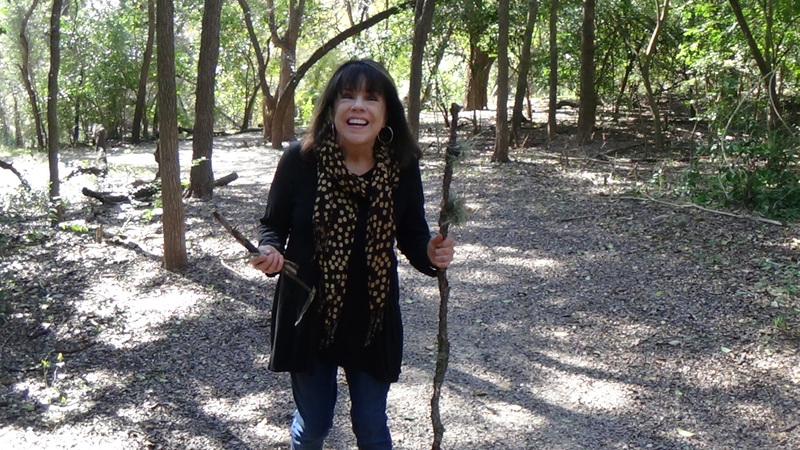 Hope your Thanksgiving was super – mine was blessedly relaxing – a real day off from work. 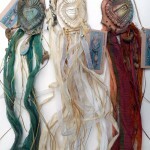 For some reason, I had forgotten what it’s like to get ready for a studio sale since encaustic exhibits and guests artists have been my focus lately, but I was hard at work all day in the Studio Tuesday and Wednesday getting ready for Saturday’s Big Ol’ Sale with Lesta, Michelle, and Alison. 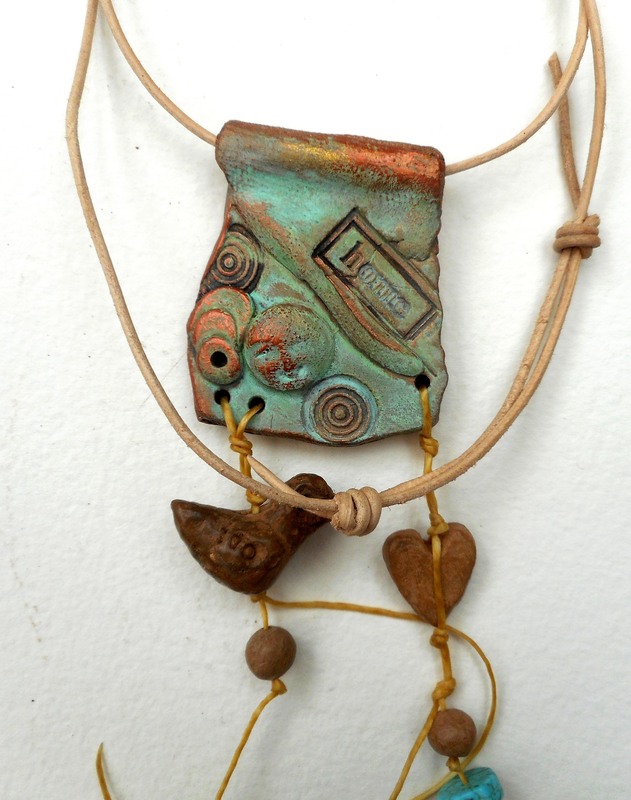 Finally, I’ve created some new pendants and face shards – some are strung as necklaces and some are loose, ready for you to play with. If you’re in San Antonio, don’t let the predicted cold weather keep you away from the Big Ol’ Art Sale – it will be cozy in the Studio and there will be lots of beautiful art and tasty refreshments. OK, back to work!! See you tomorrow, 10-4 at the Studio! What was I thinking? Two full-day workshops at the Studio back-to-back? 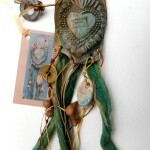 A weekend of hanging out, creating, eating and talking with eight other like-minded souls? How would all of that look? It looked FANTASTIC! Saturday was Belisle’s Collage Extravaganza and Composition Challenge. 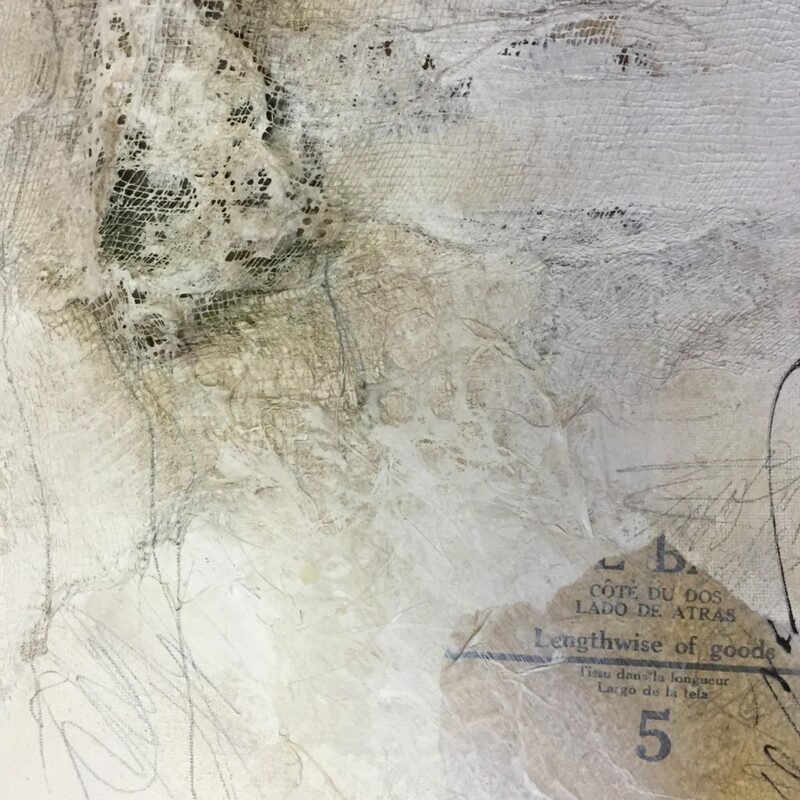 We worked on two major pieces – a collage on canvas with extreme emphasis on composition (the AB3s) and a collage on cradle board with image transfers and encaustic wax. The intrepid participants gave it their all, and we were very tired but happy at the end of the day. 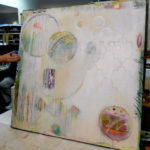 Here’s the video – see if you can detect the AB3s of composition at work in the finished pieces. But wait – there’s more! 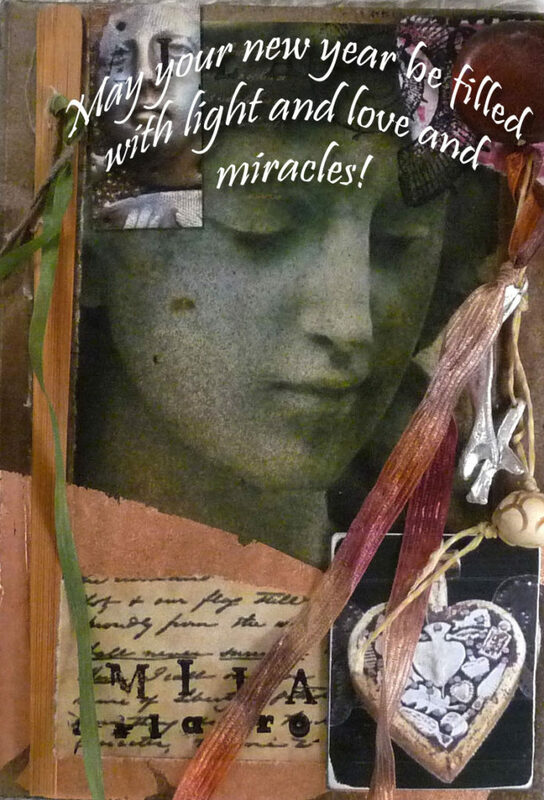 On Sunday, Lesta Frank and I team-taught a very non-traditional mixed media journaling class. Everyone designed their own pages and created a loose-leaf portfolio to collect and show their experimental surface finishes, including one really interesting Profile Page. This was Lesta’s idea and consisted of an actual dimensional profile cutout with descriptions of a personal profile as part of the composition. Very nice! Watch for it in the video, below. 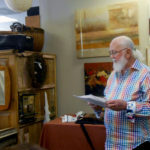 In the critiques and discussions, all agreed that the two-day experience was great, both for those who came both days and those who came on one day of choice. We had eight participants each day, half of whom were there for both days. Nicely balanced! I will plan another weekend experience in the early part of 2016. I should be recovered by then! 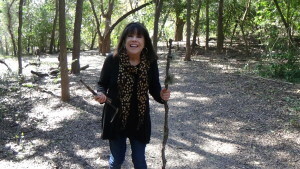 I love teaching with Lesta Frank. 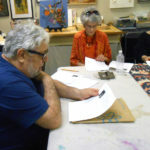 She’s imaginative, patient, talented and funny, and she has a huge following of devoted students, some of whom met us at the Studio yesterday for a special workshop. 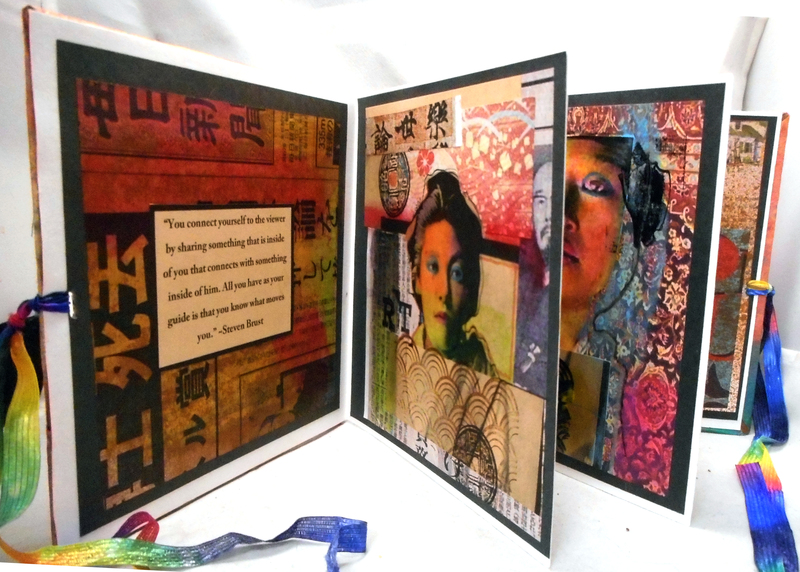 Our idea was to create mixed media accordion books that would function as a little showcase for 6×6″ collages. 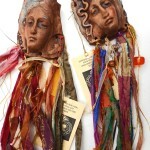 The collages feature hand-decorated paper and digitally copied faces enhanced with oil pastel. You can see the prototype I made, above. 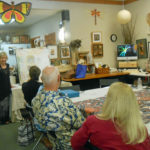 The workshop was scheduled for half a day, but as soon as Lesta got into demonstrating surface design on paper, I could tell that we should have scheduled a full day because everyone was having so much fun. We did manage to make a bunch of gorgeous paper, construct several small collages, put our gallery books together, and have time for a critique. We’ve invited the participants back for an extra two hour bonus session following Show and Tell this coming Saturday (more about that soon). 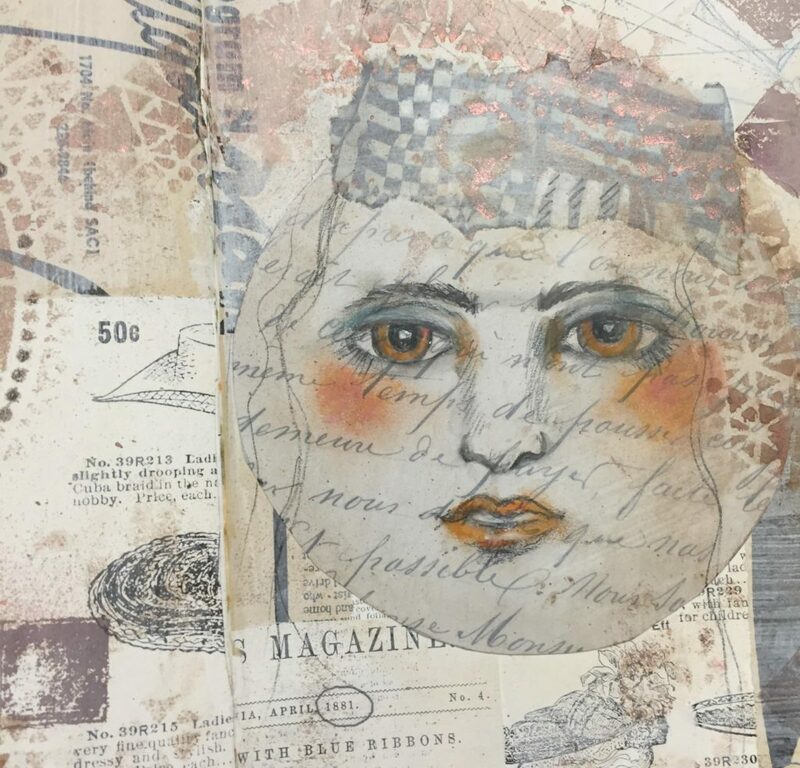 I think you can tell from the video below what an enjoyable mixed media afternoon this was – and you can be sure that we will schedule another one soon. Thanks, Lesta! 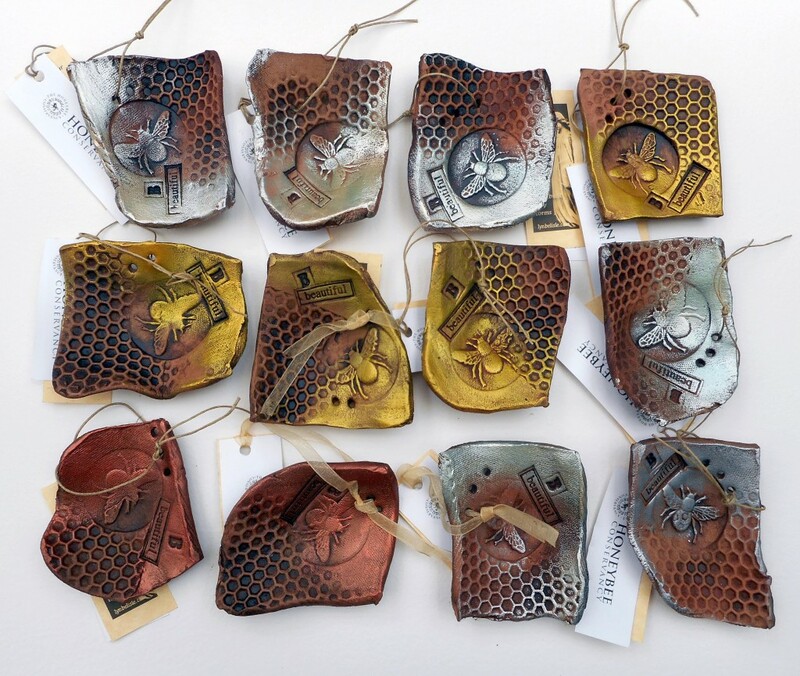 PS – congrats to artgirl3313@gmail.com who won the Friday Freebie Beeswax and Collage download – I’ll send you the download link right away, and thanks for subscribing. Seriously, there’s nothing more fun that showing with these three friends. 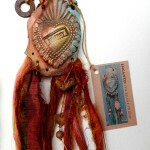 They are so creative and eclectic in their talents and craftsmanship. 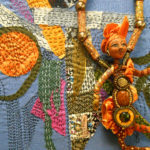 Jan’s been playing with some new metal clay pieces, Lesta’s got some amazing mixed-media work, and Alison’s fiber work is joyous and colorful. And me? 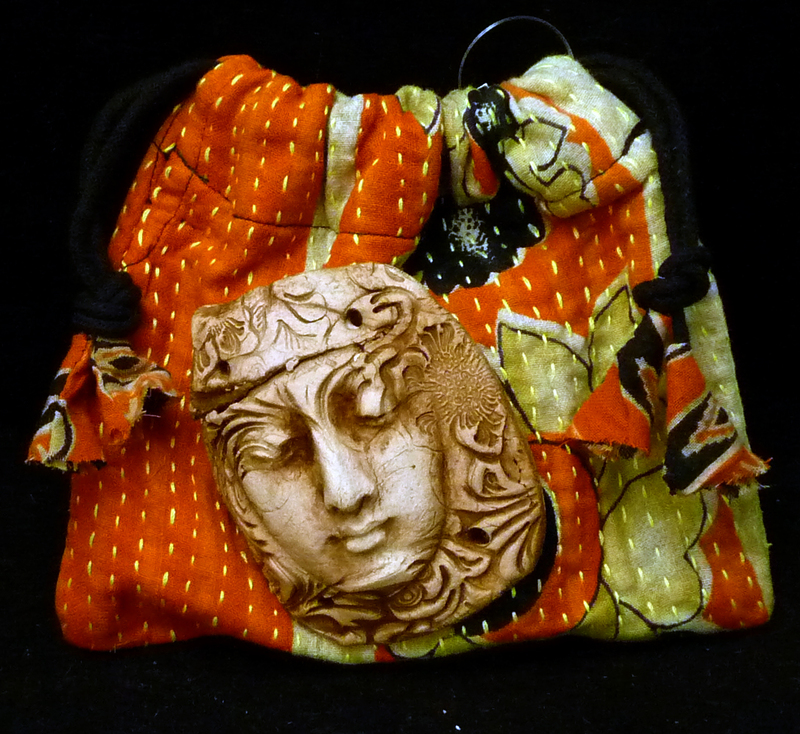 Well, I figure I’ll have some new stuff as well – small Shardians and some tissue and encaustic pieces. And I’ll fill a basket with little face shards for everyone to choose from as an extra giftie. Chef Mike is in charge of refreshments so you won’t go hungry. 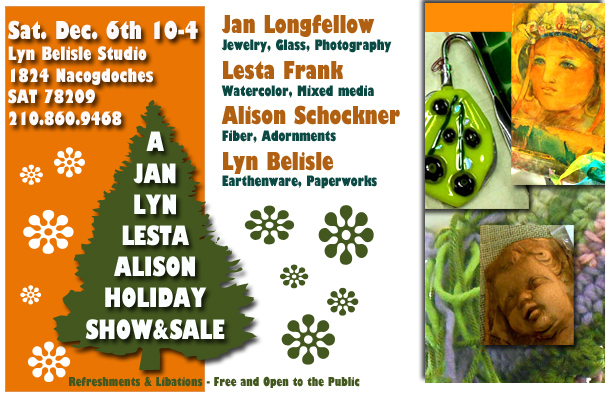 Put Saturday the 6th on your calendar and drop by Lyn Belisle Studio – it’s a busy time of year and we can make it simpler – see? Take heart, all is not lost!